Bill is our Master Poly Technician Installation Foreman. He joined our Canadian Concrete Leveling Division in 2016. He has been installing and selling PolyLevel for 17 years! Billy works on hundreds of commercial and residential concrete lifting and leveling projects throughout the city and surrounding areas. He enjoys the challenges each specific job presents and loves the people he works with! His favourite part of the day is seeing how amazed customers can be with our products, what they can do and the results that occur. In his spare time, Billy enjoys live entertainment and plays hockey! We used PolyLevel® Injection on a pool deck in Milton to improve slope, eliminate trip hazards and stabilize the area. Here we have a commercial slab on grade and void fill of an office area of nearly three inches. The job was completed in less than 4 hours using our patented PolyLevel® Injection. Our customer was unable to use their back patio because it had sloped dramatically towards the home. Our team injected high density, structural grade PolyLevel® to lift and stabilize the sunken concrete. Our customer can now use the patio to its full potential. Using PolyLevel® Injection we lifted a front and back walkway slab on grade to improve step height and slope. We used our patented PolyLevel® Injection to lift slab on grade driveway back to its original height. We also lifted the front and side walkway to improve slope. We used PolyLevel® Injection to lift slab on grade driveway back to its original height. We also lifted front and side walkway to improve slope. Finally, we sealed all joints with NexusPro® Sealant. By using our PolyLevel® Injection, we lifted this stone slab more than three inches. The whole process wasn't invasive and took under 5 minutes. The goal for this job was to ensure that the patio sloped away from the house. We were able to achieve the desired result by using our patented PolyLevel® Injection to lift and stabilize the concrete patio. We used our patented PolyLevel® Injection to lift three sets of stairs that were unattached from the slab as well as a small walkway at the rear of the garage. Once was lifted, we used NexusPro® Sealant to seal all of the affected areas. We lifted a pool deck to eliminate multiple tripping hazards using our PolyLevel® Injection. An Ajax, ON pool deck, had collapsed and was sitting on jacks and blocks. We used PolyLevel® Injection and lifted the pool deck to its original height, while also stabilizing it. These trip hazards in the walkway around a beautiful home in Brampton were eliminated, ON using PolyLevel® Injection. We used PolyLevel® Injection to lift and level sidewalk at the curb and eliminate trip hazards. 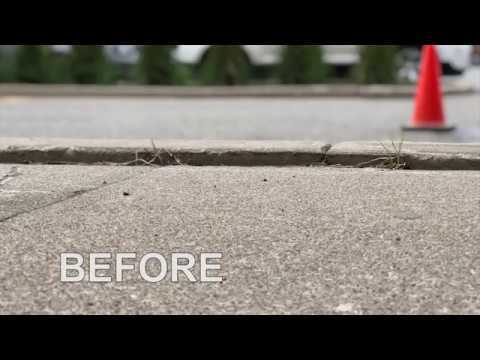 We used PolyLevel® Injection to lift and level the sidewalk at the curb and eliminate trip hazards. We sealed affected joints with NexusPro® Sealant. We used PolyLevel® Injection on a concrete slab on this grade backyard patio and seal with NexusPro® Sealant. The use of PolyLevel® ensured the concrete was stabilized and leveled.